Americans own more iPhones than any other smartphone and their total numbers continue to rise, according to a new “Connected Home Report” from The NPD Group. IPhone ownership stood at 42 percent among smartphone users by the end of last year, a 20 percent increase from the prior year. Samsung, which is the No. 1 smartphone device-maker globally, follows Apple with 26 percent of the American smartphone market. Samsung’s Android devices increased their reach by about 18 percent from the prior year in the U.S. Motorola is a distant third, followed by LG, HTC and then Blackberry. 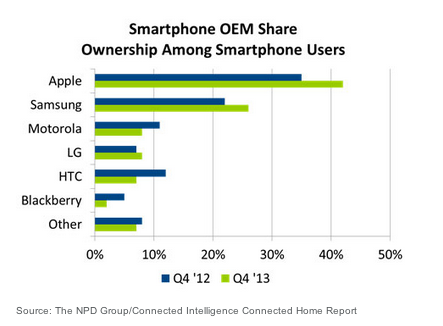 Overall, smartphones now account for 60 percent of all mobile phone users in the U.S., according to NPD. That’s a jump up from 52 percent in 2012. NPD analysts noted that data usage is increasing each year as more and more consumers opt for smartphones, and music apps are helping to drive that data consumption. Pandora remained the No. 1 music app in the last quarter of 2013, followed by iHeart Radio, Spotify, TuneIn Radio and Slacker Radio, according to NPD.